We have a large selection of outdoor pottery that can be turned into beautiful water features. Add the soothing sound of flowing water to your patio,deck or front porch. You choose the pot that works best and we’ll plumb it up for a minimal charge. We have all the components as well: pumps, basins, lights and more. Come see our selection of Pottery Fountains already set up and running, it will help you decide which one you like best! Watch our YouTube video to learn tips for keeping your water feature trouble-free. Add water to the reservoir daily. Check that you are not losing too much water from splash, which goes outside the reservoir but should be captured and re-circulated. Turn the ball valve down to reduce splash outside of the reservoir area. Some people have used landscape fabric on the top of their reservoirs to keep debris out, but the landscape fabric can’t let enough water through to keep the reservoir filled. Please do not use landscape fabric on the top of your reservoir. Is the fountain water cloudy? During warmer temperatures, the water grows algae faster, so use Bio-Sludge or other water-clearing formulas. We carry Bio-Sludge at Terra Casa, and it’s safe for plants and animals. Is the pump making strange noises? If there is not enough water in the reservoir, the pump will make a sucking sound because it’s taking in air along with a bit of water. The pump must be submerged at all times. Also, the pump may be lodged against something that’s causing it to rattle, so try moving the pump to a different location. If the pump continues to rattle, we will exchange it for another one. Is the bubble too high or too low? We put an adjustable ball-valve on each center PVC pipe so that the height of the bubble can be altered to your satisfaction. Remove your watch, roll up your sleeve and turn the ball-valve a quarter turn. If any other issues arise, please let us know. Ideally, drain the water out of your fountain and basin, then cover with a tarp (or furniture cover). Draining and covering is the best way to protect your fountain over the winter. Although running water generally doesn’t freeze, we found out last winter that indeed it does! Especially for prolonged periods of freezing temps. Your second choice is to purchase an electric de-icer. We now carry electric de-icers at Terra Casa. They range in price depending on the size needed for your water feature. Don’t add anti-freeze or anything else to the water to try to keep it from freezing, since we don’t know how it will affect the pot. Do NOT let water sit in your pot and freeze. The expansion of the water as it freezes will crack the ceramic. If your pot does crack, it can be repaired with a waterproof epoxy available at Home Depot, but may no longer be suitable as a water feature. The calendar says that Winter hasn’t officially started yet, but in some parts of the United States, Mother Nature is saying otherwise, with temperatures already dipping below freezing in several cities around the country! Therefore, we wanted to remind you of the recommended steps to protect your LiquidArt fountain. The following steps are all simple to do, and the procedures that apply to your fountain will depend on the temperatures and weather in your area. The best way to ensure protection of your fountain is to disconnect the pump from the manifold (the PVC piece with the water flow control valves). Then use the pump to pump out the majority of water from the reservoir, and bring the pump inside for the season. Consider covering your fountain with a plastic tarp to protect the rocks and to keep the reservoir from filling up with rain water or snow melt. If you are in an area with temperatures that are at or barely below freezing at nighttime but are above freezing during the day, you may choose to keep your fountain running. By keeping the water moving, the water in the reservoir will usually not freeze deep enough to affect the pump. Again, this is suggested only when temperatures are expected to be above freezing at least a few hours during the day or night. 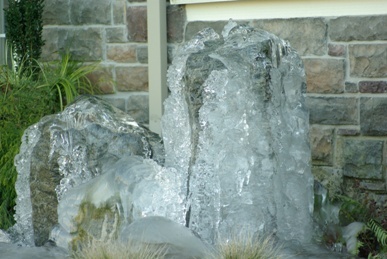 If you choose this option, ice may form on your fountain rocks (as pictured). This is fine, and shouldn’t damage your rocks. However, as more ice forms, less water returns to the reservoir, so it’s important to check the water levels in the reservoir frequently! Water levels can drop dramatically in a short time when temperatures are low.